(CNN) -- Truckers who text while driving are 23 times more likely to crash or get into a near-wreck than an undistracted driver, while car drivers face the greatest danger when dialing their cell phones, a transportation study found. The likelihood of a crash due to texting disproportionately affects truckers, according to a new study. The likelihood of a crash due to cell-phone use disproportionately affected truckers in comparison with car drivers, according to the study by the Virginia Tech Transportation Institute. When dialing, the chance of an accident for a truck driver is 5.9 times more likely versus 2.8 times more likely for a car driver, the study found. If a trucker reaches for an electronic device, the crash risk is 6.7 times as high, while the risk for a car driver is 1.4 times as high, it showed. Truckers only fared better while talking or listening on a cell phone, with the increased risk one time more likely compared with 1.3 times for a car driver. Hanowski attributed the high risk of text messaging for truckers to drivers looking at their cell phones and not at the road. "Text messaging, as you can imagine, if you're engaged in a text message it draws your eyes away from the forward roadway," Hanowski told CNN on Tuesday. "From the study that we did, we found that it was almost five seconds out of a six-second window that we were looking at that the driver's eyes were off the forward roadway, so that's a tremendous amount of time driving at highway speeds and a lot of opportunity in that period of time to get into trouble." A news release on the study put Hanowski's point into perspective: If a highway driver takes his eyes off the road for even 4.6 seconds, it "equates to a driver traveling the length of a football field at 55 mph without looking at the roadway." Because of the increased dangers associated with cell phone use while driving, the Virginia institute suggests that drivers avoid using phones while driving, even if they are communicating with a hands-free phone, which lessens risk, the news release said. 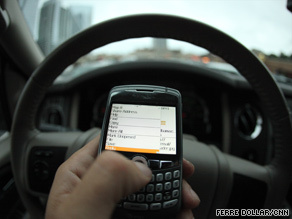 Researchers also recommend that newly licensed teen drivers not use phones while driving and that texting be banned. "With regards to texting, it's really kind of a no-brainer," Hanowski said. "And I should point out we're scientists, we're not legislators, but when you see these kind of findings with regard to this level of risk, texting certainly should be banned. There's just no question; there's no redeeming factors associated with why a driver would be able to text and drive." Texting has been linked to a few high-profile crashes recently. The operator of a Boston, Massachusetts, trolley was indicted in July on a charge of gross negligence after he admitted to texting seconds before a collision with another trolley, according to the Suffolk County district attorney and a National Transportation Safety Board official. The May accident injured 62 people, the Massachusetts Bay Transportation Authority said. In September, a commuter train engineer missed a stop signal while trading text messages with a friend, leading to a collision with a freight train that killed 25 people in California, according to federal investigators. The accident injured 101 people. CNN Radio's John Lisk contributed to this report.